Vedic Astrology, as with all branchs of Vedic knowledge, is aimed at enhancing human welfare by ameliorating sufferings. With this grand mission, sage Parasara (one of the grand eighteen sages like Narada, Vashishta, Jaimini etc.) 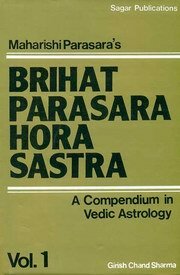 authored this encyclopeadia text in the principals of Vedic Astrology designated as Brihat Parasara Hora Shastra (or BPHS). As the name connotes, the text comprises of basic principals of Vedic Astrology in a comprehensive way. It essentially deals with the delineation of life from conception to death, the cardinal underlying principals being those celestial conditions at birth that influence to determine the pattern of the whole life of human beings. The author's two decades of practical experience has been the basis to explain specific fundamentals principles to be used synergistically to interpret horoscopes. Special emphasis has been laid to highlight the understanding of Dasa system alongwith harmonic charts and Avasthas of planets. I read out the book! This is extremely interesting. The book is not mere a printed volume but a true guide for a new learner. Definitly the finest of all Jyotish texts. This edition is beautifully commented and translated. A must read for all Jyotish scholars. I read out the book! This is extremely interesting. The book ..